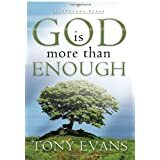 God Is More Than Enough (LifeChange Books) ReviewFirst, the title of the book caught my eye because YES I know it is true - that God is more than enough. So at first look all I knew was the title of the book which made me like and desire it. Then once I received the book I came to realize that it was a book by best selling author and Pastor Tony Evans concerning Psalm 23. The book itself is small in size as well as in the number of pages - 90 plus the extra pages every book always has. But this is no small book when it comes to delivering the message that God is more than ENOUGH. This book speaks volumes when it comes to the matter of addressing the sufficiency of God for the life of every believer. In Chapter 1 of the book, Pastor Evans asks, "Just Who Is Your Shepherd?" And right from the beginning of the book in the first chapter he starts hammering hard at our hardened self-sufficient, self-serving hearts...who is our Shepherd? And he makes the point that many of us claim Jesus as our Savior, but then asks us is he our Shepherd? This is convicting territory and the spiritual waters can get pretty rough if you have just been dabbling in Christianity; I mean you are living the "a little bit of Jesus goes a long way," or "just a little dab" of Jesus over our sinful lives and we are good to go kind of Christian life. Well, Pastor Evans is not going to tread lightly concerning this matter because he is right...we need to know who our Savior, Lord and Shepherd are...when life is going good as well as when it is not. In Chapter 2 Pastor Evans writes about the fact that "GOD is More Than ENOUGH to Meet All of our Spiritual Needs." Every single one of them! He states that "God wants to give us back our soul," or as he refers to it, our personhood. I like that. Amen! I needed to be reminded of that. Jesus has given us back our soul...our personhood back and he can and will meet all of our spiritual needs as the Shepherd of our person. In Chapter 3 he writes about the fact that GOD is "more than ENOUGH to Meet Our Directional Needs." God wants to be our "spiritual tour guide" as he refers respectfully to God, on our pilgrimage through this world. In Chapter 4 Pastor Evans writes about how GOD is "more than ENOUGH to Meet Our Emotional Needs." He makes the statement about God, "when he's all you have, he's all you need." Now that is powerful. Think on that statement for a while. In Chapter 5 author Evans shares that GOD is "more than ENOUGH to Meet Our Physical Needs." He refers to him as a "good provider." I don't know what your experience with God has been; however, I have found that what Pastor Evans writes is true. Many times I have failed GOD but he has NEVER once failed me. Not ever! Who else in this universe can we say that about for our lives? And Chapter 6 he writes about what is very dear to my heart and that is that GOD is "more than ENOUGH to Meet Our Eternal Needs." He refers to our position as "sure and secure" for all eternity as we "shall dwell in the House of the LORD forever." (Psalm 23:6) And it does not get any better than that. So, God...our God...our Shepherd IS "more Than ENOUGH to Meet ALL of our Needs" if we will only but get out of his way and out of our own way...(sometimes we are our own worst enemy getting in God's way and our own- the devil and his spiritual cohorts needs do nothing because we are more than ready and happy to mess things up on our own), and live for him by faith and just let him be who and what he wants to be in our lives...and that is our Shepherd. Want to learn more information about God Is More Than Enough (LifeChange Books)?